I got the poster while at Warrior Fest my freshmen year of College from a booth set up by the local Assemblies of God Church here in Sterling. 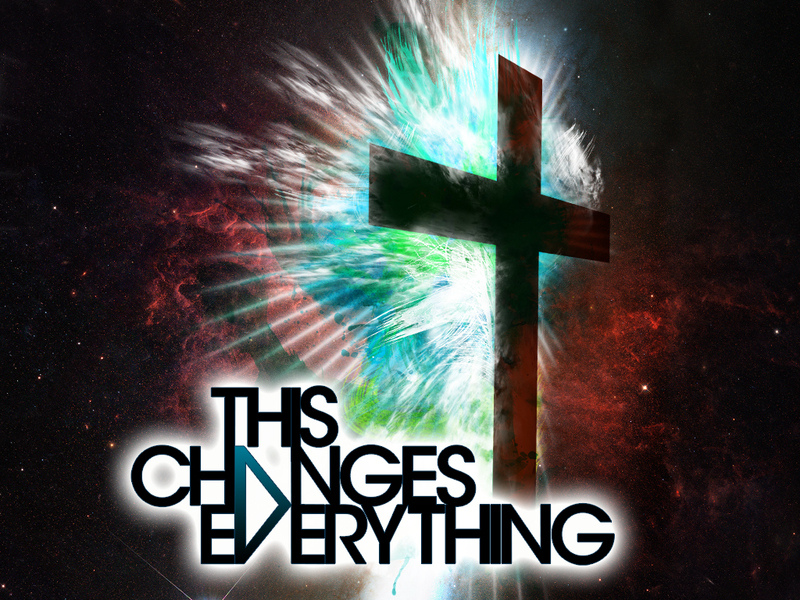 The poster, is a picture of the cross back lighted by a wash of vibrant colors, in big block letters it reads “This Changes Everything.” At that time I was still a legalist, I hadn’t had my encounter with my friend, my whole system of truth was based on going my own, deep study of the Gospel wasn’t important to me and my understanding of God was that he was small and angry. But I liked how it looked so I hung it above my desk where it still hangs today. As I’ve been reading and studying Romans I’ve been constantly confronted by the question, why is the cross so important. Why exactly did this one act of punishment for someone who the Pharisee’s and religious leaders considered a heretic change everything. How does a punishment that the Jews considered cursed cause a complete change. How does this work? Since the first presentation of the Gospel in Genesis 3:15 where the Lord tells the serpent “I will put enmity between you and the woman, and between your offspring and her offspring; he shall bruise your head, and you shall bruise his heel.” (Genesis 3:15 ESV). God had a plan in place and I don’t think anyone understood what it really meant when once again Isaiah began talking about Christ being “Pierced for our transgressions and crushed for our iniquities” (Isaiah 53:5a). (Luke 9:22 ESV). Or the implications of the last supper. (Lk 22:1-38, Mt 14:17-25). Did they realize what these things meant or had they missed it all together. I guess it would make since, Israel at this point was looking for a military leader, the Maccabees Revolution of the interdepartmental period still on their minds. They were expecting someone to come in and save them from the “oppressive” Roman Empire, a hero of the people. Instead they got the son of a carpenter, a soft but authoritative speaker who loved those around Him and called out the religious leaders, all while upholding the law. Instead of a Military leader they got a revised teaching, Instead of freedom from Rome they got freedom from making daily sacrifices and sin, and a Cross. The Key word here is found in 3:25, “through the redemption that is in Christ Jesus, whom God put forward as a Propitiation by His blood.” Suddenly this changes everything. Think my friends, we were under a sacrificial system, a system where we daily had to sacrifice and cleanse ourselves to be presentable to God. That sin we were repenting for, that sin that angered God to the point where He should have destroyed us and at one point did destroy humanity with the exception of Noah and his family. The same sin that caused God to turn us over to a depraved mind (Romans 118-25), the same sin that spurred God’s wrath against us, we have now received propitiation (total appeasement of God’s wrath) through the blood of Jesus Christ on the cross. Suddenly instead of death we have life through the death of Christ. We now have peace with God (Romans 5:1) because of the blood of Christ (Rom 5, Col 1:20). Instead of getting what we deserve we got what Christ deserved and instead of getting what He deserves, He got what we deserve. The great Reformer Martin Luther called this “The Happy Exchange” and indeed it is. Instead of wrath we receive grace. Once you really start to think about this it really makes John 3:16 a lot more powerful. Think about it, add the thoughts from Romans in. For God so loved the world that He gave His only begotten son, to be the propitiation for our sins so that we might have peace with God through the blood of Christ, that whosoever believes in Him shall not perish but have everlasting life. My friends this is grace stemming from love of a big God who is living and active in our lives. This is where our salvation comes from, not from anything we’ve done but because of what Christ did, not because of our works but the grace of God, this is how the cross changes everything. Now we are free from sin, buried with Christ and raised to new life in Him, now dead to sin and given newness of life, and have become slaves to righteousness and committed to a new standard of teaching that is the word of God. (Rom 6). As the real message and meaning of the cross has begun to come alive to me, as the real meaning of the life of Christ has begun permeating my life and my thoughts I find I am moved to tears by the cross. After a discussion today I found myself in tears walking to my room because of the beauty of this message. The bloody, cruel death we are given a description of in the Prophets and the Gospels is why we are free. We deserved death, but we’ve been given life. My friends here is God’s heart, here is our new life, here is grace. This is why this message is so offensive, why some churches have removed the cross from their walls. Because in our culture today we’ve been brought up to be self-focused and the message of the cross makes us totally dependent on Christ for our salvation. Let us rejoice in this, let us find peace in this and let it daily remind us that we were sinful and have been new, washed by the blood of Christ. Oh dear friends, I say again, this is grace!